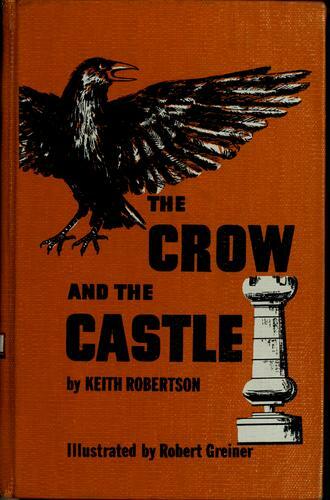 The Crow and the Castle is the third of four books in the Carson Street Detective Agency series by Henry Reed, Inc. author Keith Robertson. In this book, teen detectives Neil, who narrates the story, and Swede, his best friend, are hired by a stranger in town to take photographs of a chess set owned by the ornery and hot-tempered Captain Wudge. In their attempts to gain access to Captain Wudge's house in order to snap the photos, they discover that some housebreakers are also intent on getting inside so they can steal a chess set from the Captain's collection. Curious as to whether the stranger who hired them is connected to the housebreakers, the two boys get to know Captain Wudge and slowly piece together their nefarious plot. Meanwhile, Neil's pet crow, Hector, complicates matters with his penchant for collecting and absconding with small objects. This book was such fun to read. The main characters are funny and charming with a mischievous streak and a boyish sense of humor. Unlike the Hardy Boys books, whose storylines often feel forced and inauthentic, this book is sufficiently grounded in reality to make almost anything feel believable even if it is far-fetched. I had no difficulty at all accepting that these boys were accomplished detectives, nor was it difficult to buy into the role Hector the crow winds up playing in the mystery plot. Robertson's light touch and tongue-in-cheek tone make it impossible to take the book too seriously, which makes it very easy to suspend one's disbelief and just enjoy a good mystery. Disappointingly, this book is out of print and so rare I doubt I will ever have a chance to own a copy. I'm so thankful that Open Library has it, however, because this was the exact kind of mystery I'd have loved as a kid, and I would have hated to miss out on it. I loved all the details about the history of chess and chess sets, and the fact that, though there is some real danger to the boys in the story, the reader is never really scared and it is always clear that things will come to a safe and satisfying ending. Book two of the series, Three Stuffed Owls (1954), is also available from Open Library, so I hope to read that in the near future. The last book, The Money Machine (1969) is also pretty widely available from used booksellers, so it's possible I'll be able to get my hands on that as well. Sadly, book one, The Mystery of Burnt Hill (1952) is selling on Amazon right now for over 95 dollars, which is outside of my book budget for any single title, no matter how much I love the author! This book was a wonderful surprise, and I would recommend it wholeheartedly to fans of the author as well as to young teen boys who are mystery fans, chess players, or both.